Subway station in 8 minutes. Located near French Embassy in Kiev, 100 meters from Lvivska Sq. 2nd floor 1 bedroom 20 sq.m. 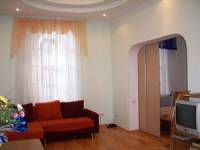 , 2nd bedroom 18 sq.m. living-room 22 sq.m. Cable and Satellite TV, CD Player, telephone, washing-machine, jacuzzi, full kitchen. Subway station in 2 minutes. No subway nearby, use land transport. This spacious two-bedrooms apartment is located on the second floor of nineteenth century building with high ceilings (4.2 meters). Ground floor houses the hairdressing salon and the small flower shop. Entire apartment consists of two bedrooms, living-room and kitchen. Main bedroom is supplied with king-size double-bed, another with transforming sofa and work cabinet's furniture. The living room has huge corner couch and big LCD TVset. Air conditioners are installed in each room. Bathroom is bright and nicely decorated with spanish tile and comes with triangular bathtub and shower. Powerful and spacy kitchen alows cooking meals and is supplied with fridge, microwave oven, gas stove, dish-washer and washing machine. Free and unlimited broadband internet with Wi-Fi acess point at your disposal as well. Cable television with numerous English, French, German and Italian channels. All kitchen tools and techniques, including gas stove and microwave oven. This apartment is located in historical building of tsar's epoch in Kyiv's downtown, just a few steps away from the central street Kreshchatyk and Square of Independence, backwards from the Hyatt Regency Hotel. This district is considered to be the most desirable residential area for tourists and foreigners. 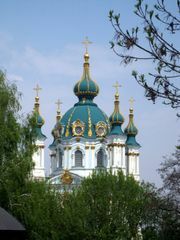 All sightseeings are nearby: Sofiivska church, Mykhailivska church, Andriivskyi Uzviz (descent), Volodymyrska hill park. Metro stations are adjascent as well (Maydan Nezalezhnosti, Zoloti Vorota"). You will find a lot of open-air restaurants around, one of them is the oldest in Kiev, renown Irish pub O'Brience. Also being said our office is located next door in the same building and our managers are bend over backwards to help you regarding any question in Kiev.